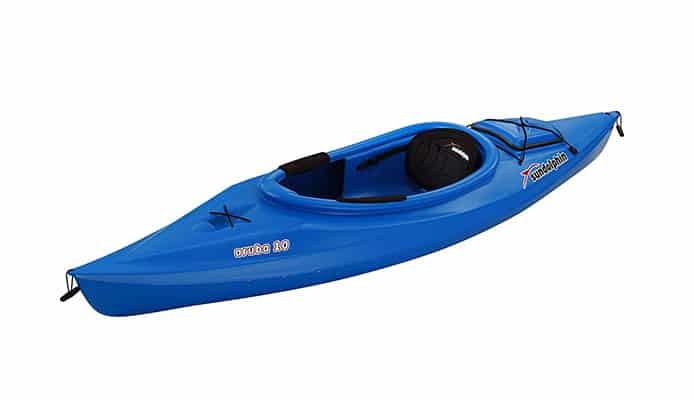 The Sun Dolphin Aruba 10 is a high-quality recreational kayak that is very exciting on both calm water and smaller rapids. This sit-inside kayak is lightweight and very compact so it’s really easy to just throw it in your car and go. In addition, the price point makes it even more attractive. You will get most out of this kayak when using it for shorter trips. Because it’s compact, the storage space is limited. However, the cockpit itself is large and easily fits any adult. To boost comfort, the manufacturer has made footrests and seat adjustable, so everyone can find their optimal position. In addition to all the nice things we mentioned, the kayak is really strong and durable, so you can be worry-free for many years. Be sure to read through the review and find out why so many kayakers choose it as their favorite recreational vessel. Usability: Users are generally pretty satisfied with how this kayak performs. Because it isn’t too long, it’s very easy to control regardless of your paddling technique. It’s most enjoyable on lakes, ponds, and calm coastal waters. If you want, you can get more excitement out of it since it can be used in rapids too (up to class II). The V-shaped hull is efficient in the water since it provides you with good glide and tracking. Unfortunately, this package comes without a paddle. There is a different bundle that includes a paddle, but it also costs more. You need to buy a paddle yourself, and we recommend you get a lightweight kayak paddle. It is going to be efficient while preserving your energy at the same time. 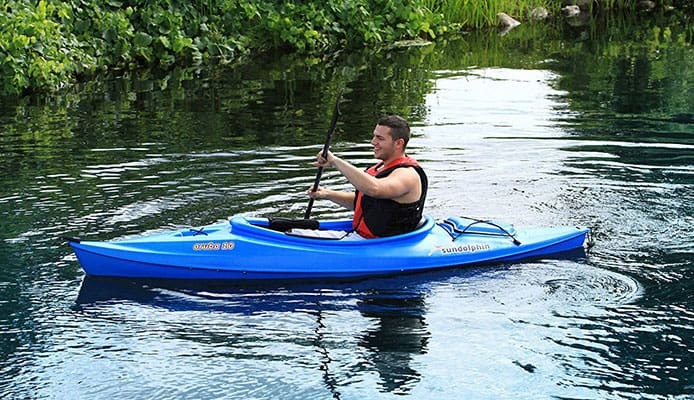 This is a basic kayak for fun time on the water, and it can even be used by kids. This being said, it has its limitations, mainly because of the size. If you plan to go on multi-day trips, you should get a camping kayak for that purpose. Furthermore, even though you can mount some fishing gear on it, it won’t be as convenient as a true fishing kayak. Because of this, you should carefully think about how you want to use it. 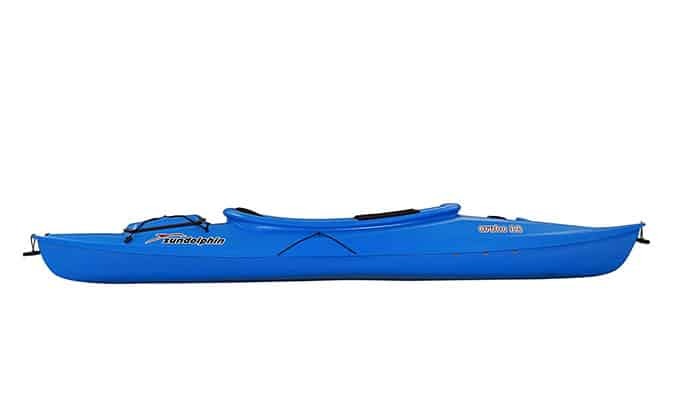 Stability: Because it’s 30 inches wide, this kayak has great primary stability. Kayakers say that the chance of tipping over is very small, even if you get caught into stronger waves and wind. On the other hand, the larger width and shorter length impact the speed, so you probably won’t be able to win races with this kayak. However, this isn’t a problem for most users, because they think that kayak safety is more important. Additionally, never forget to wear a life jacket no matter how safe you might feel. Since this is a sit-in kayak, some amount of water is going to get in your cockpit is you don’t have a spray skirt. The cockpit has a raised collar that blocks splash and prevents a larger amount from getting in. And even if it does, the balance and stability of this kayak won’t be disturbed. Afterward, all you need to do is simply open the drain plug on top to easily get the water out (when you get back on the shore). Storage: To be honest, this is probably the biggest downside of this kayak. It has limited storage space and relatively small weight capacity, which means you carefully have to choose which of the kayaking essentials you’re going to bring with you. Behind the seat, you’re going to find a small storage compartment. It’s pretty limited in size, so you can only fit several smaller items such as sunglasses or a kayak knife. Some people like to fill this area with ice and then keep their drinks inside. Furthermore, you can store your valuables too, but only if you put them in a small dry bag first. Even though it has a gasket, the compartment is not fully waterproof, and you don’t want to be risking any damage. The hatch cover is held in place by crossed bungee cords, which are also convenient for securing other items. In front of the cockpit, you will find a neat little bottle holder. It uses two bungee cords and seems pretty convenient. However, some kayakers complained that it’s too far away from your sitting position and that reaching the bottle isn’t easy. The same goes for the back compartment too, since you have to completely turn around to open it which can be a problem in a sit-in kayak. Cockpit: Kayakers claim that the cockpit is larger than it looks and spacious enough even for large users. It’s really easy to get in the kayak, and once you’re inside it doesn’t feel restraining. As we mentioned earlier, the foot braces are adjustable. They slide on a rail, which allows you to find the most comfortable position for your legs. On a different note, the seat could be better. You don’t get any type of padding underneath you but instead sit on a molded seat. Some people say it can become uncomfortable after a while, so you should get some kind of cushion to make it better. On the other hand, the backrest is padded and adjustable, which is good. Of course, you can always get a new kayak seat if you want to improve comfort. As we mentioned, you get plenty of leg room in the Sun Dolphin Aruba 10. However, when comparing sit-in vs. sit-on-top kayaks, you don’t quite get the same freedom that an open cockpit gives you. On the other hand, it gives you additional protection against wind and splashing and allows you to use the kayak even during colder months. Transportation: This is a very portable vessel that fits in most trucks. If it doesn’t, you can always equip your vehicle with a kayak roof rack. It’s very lightweight, so a single person can carry the kayak. There are carry handles on both bow and stern that make this very easy, and they can also be used to drag the kayak when getting in and out of the water. Durability: Users say that this is a tough little kayak. The build quality is fantastic, and the polyethylene is really difficult to damage. Additionally, the UV protection guarantees that the vibrant color of your kayak will remain steady for many years. As we mentioned, you get a 2-year warranty on the product, which gives you peace of mind if something goes wrong. Price: 100% – This is one of the most affordable recreational kayaks you can buy, which is a big plus if you’re conscious about your budget. Sun Dolphin really tries to give you value for your money and delivers an incredibly strong and durable boat. Material: 95% – The polyethylene hull on this kayak is next to indestructible, which is the ultimate goal. You don’t have to worry about damage from hitting obstacles or even dragging your kayak on the ground, allowing you to be carefree when using the kayak. Design: 85% – We like that this sit-in kayak offers plenty of space. This is not always the case with this type of kayak, so it’s a big plus. On the other hand, some other things could be improved, particularly in terms of storage and comfort. As for the appearance, it looks great and comes in a nice palette of colors for you to choose from. Overall: 93% – We really appreciate that the Aruba 10 kayak is lightweight and easy to use. 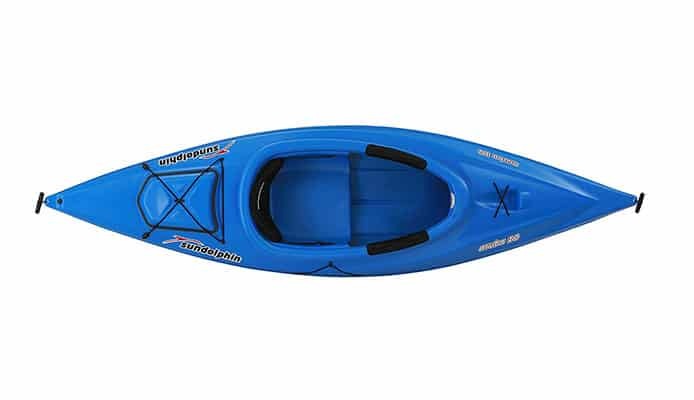 It’s a great choice for any kayaker regardless of size, age and paddling experience. As you had the chance to see, the Sun Dolphin Aruba 10 ranks very high among kayak enthusiasts, and for many good reasons. It’s a tough kayak that will easily conquer almost anything you throw its way, while still allowing you to enjoy yourself. It’s stable, safe and performs great. The low price tag must be mentioned again since it’s important to people who are looking to limit the overall cost of kayaking. It’s a highly recommendable vessel for anyone who wants excellent build quality while saving some money along the way. 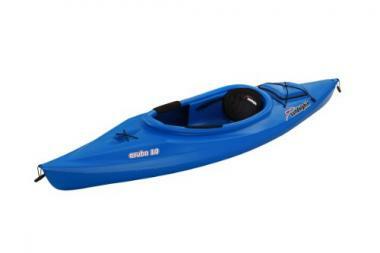 The Sun Dolphin Aruba 10 is a high-quality recreational kayak that is very exciting on both calm water and smaller rapids.